Unfortunately it’s still hard for us to walk into a store and find tall clothing. Or we may find “tall” clothing that is anything but. 1) SIZE IT UP. Before you order the tall lengths online go into your local store and try on some sizes. Knowing your size with the retailer you are ordering from will cut down on returns. Most of the tall lines that are online are the regular cut, lengthened. Thus, trying on the regular cut will give you an accurate size to order in the tall version. Also, get your measurements taken by a seamstress. Having accurate numbers is key when looking at a size chart for a garment. If you have the wrong measurements, you will order the wring size. It’s that simple. 2) GET IN SHIP SHAPE. 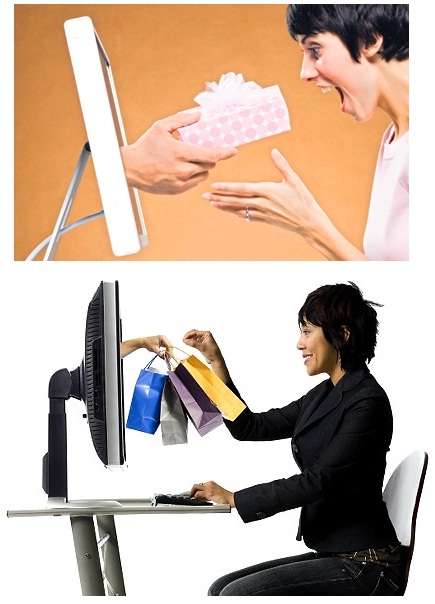 Look for online retailers that offer free shipping both ways. It may take awhile to get to you (as it’s usually ground) but you won’t pay anymore then you would in the store. With free shipping it’s like you are getting a personal shopping trip wherever you are. No extra fee, no walking from store to store. You see it, click it and someone brings it to you at no extra cost. A definite win-win situation. 3) COUPON ME. Before you order stop everything, open up another window and search for an online coupon code. More often than not there is always some type of code to keep money in your pocket. Simply search for the store name and ‘coupon code’ and a bunch of deals will pop-up. You have to search for one that hasn’t expired but trust me, there is one out there that will save you some moolah. 4) VIEW THE REVIEWS. What better way to see if something is worth the buy than from real people wearing the clothing. For example, 9 times out of 10 if reviews say you should order one size down, you should do just that. Reading them on the retailer’s site is good but for the most accurate reviews use an outside site like Buzillions.com. Real people give real opinions so always check out a couple of reviews before you purchase. 5) GET SOCIAL. Almost every retailer uses some kind of social media outlet. If you have questions before making an online purchase or want to see what people are saying, tweet or facebook them! It’s the easiest way to have direct contact with the store and its customers. And now...it's time for the main event. 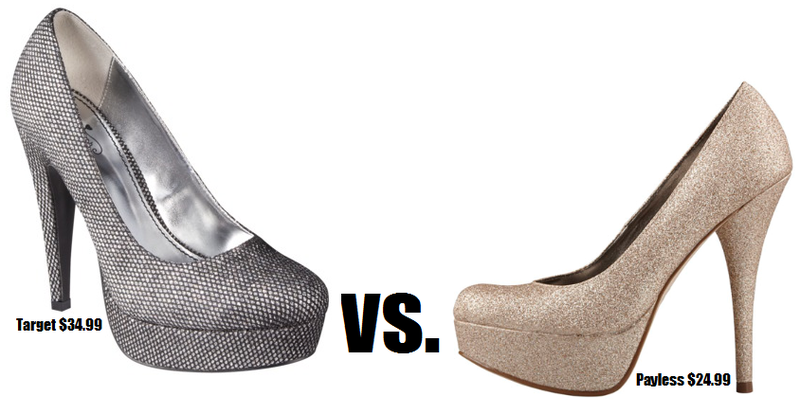 In the left corner, standing at 3.75", mad pewter sparkle, comes in sizes up to 12 and a platform that won't quit, from Target...THE BLISS SPARKLE PUMP! And in the right corner...standing at 5", a 1.5" platform, available in sizes up to 13 and gold glitter glam, from Payless...THE KOMET PLATFORM PUMP! Let the match begin! OK, that was a bit dramatic but I have a huge decision on my hands...which pump should I wear on New Years? I love both, have accessories to compliment both and they both go with my Kate Long Sleeved Rouched Dress from Height Goddess. Which one should I rock? Tweet, post or comment. Need your own HOT shoes for New Years? Click the pic to visit the TallSWAG shoes page. Personally, I like to start with a little black dress and then stack the deck with HOT shoes, bling, blang and a coat that introduces your whole look the minute you walk in. SWAG out your holiday part-tays with these tall picks. Not a fan? Find your own with the TallSWAG links to the left. Kate Long Sleeve Rouched Dress at HeightGoddess.com. $138. Sizes small to large. Shown in black. Also comes in hot pink. Wink Gold at Size12.com. $69.99. Sizes 10-12. Blair Jewel Bow Flat at Payless.com. $29.99. Sizes 5-13. Steve Madden Sasha Heel at Barefoottess.com. $79. Sizes 11-14. Enzo Angiolini Mistle pump at Nordstrom.com. $89.95. Sizes 4-12. J. Renee Dayna at Zappos.com. $88. Sizes 5-13. Crushed Fur Coat at LongtallSally.com. $239. Sizes 6-18. Only low availability left! Strobe lights at CandidArt.com. $15.